I prepared this bhaji today as an accompaniment with theek puri.This is a dry bhaji which is very easy to prepare.This is my Amma s recipe and is one of the best recipe.My Amma adds coconut bits which enhances the taste.She used to prepare this often for my Papa s sake,since this is his favorite dish with the combination of puri.I’m posting this separately so that it is easy to link whenever required.Goes well with Theek puri. Wash,boil the potatoes in the cooker and cut it into small cubes. Heat oil and splutter mustard seeds,add curry leaves and green chillies and fry for a second. Add turmeric powder,chopped potato,salt to taste and coconut bits and cook it for sometime on low flame and off the flame. 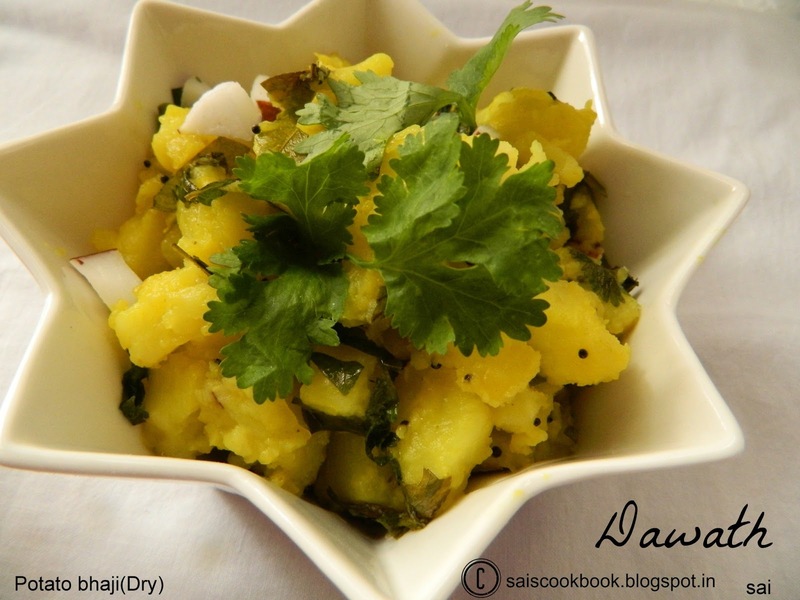 Garnish with coriander leaves and serve it hot with puri, or theek puri and sheera.